MANILA, Philippines - State weather bureau PAGASA on its first bulletin for 'Bagyong Seniang' released on Sunday morning, December 28, 2014 said that the Low Pressure Area (LPA) located at East of Hinatuan, Surigao del Sur has developed into a tropical depression. At 4:00 AM today, the center of Tropical Depression 'Seniang' was estimated based on available data at 340 km East of Hinatuan, Surigao del Sur (7.9°N, 129.4°E). 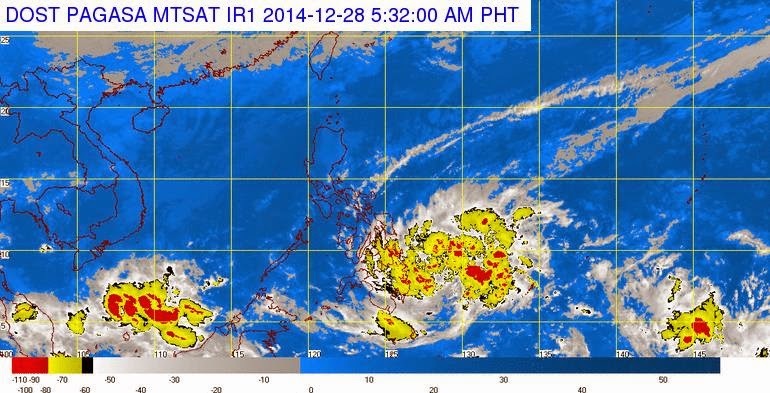 It has maximum winds of 45 kph near the center and forecast to move West at 11 kph. Typhoon Seniang expected landfall is on Monday morning (December 29) in the vicinity of Hinatuan, Surigao del Sur and associated with occasional rains with occasional gusty winds and moderate-heavy rainfall (7-15mm per hour). 24 hour (Tomorrow morning): 60 km East of Hinatuan, Surigao del Sur. 48 hour (Tuesday morning): 120 km East of Dipolog City, Zamboanga del Norte. Public Storm Warning Signal No. 1 (Winds of 30-60 kph is expected in at least 36 hrs) was raised in 10 areas: Surigao del Norte, Surigao del Sur, Agusan del Norte, Agusan del Sur, Davao del Norte, Davao Oriental, Compostella Valley, Camiguin Island, Misamis Oriental and Bukidnon. Caraga and the provinces of Misamis Oriental, Bukidnon, Camiguin, Davao del Norte, Davao Oriental and Compostela Valley will have rains with gusty winds. Bicol Region, Visayas and the rest of Mindanao will experience cloudy skies with light to moderate rainshowers and thunderstorms. Cagayan Valley, Cordillera, Ilocos Region and Central Luzon will have cloudy skies with light rains. Metro Manila and the rest of Luzon will be partly cloudy to at times cloudy with isolated light rains. The rest of the country will have partly cloudy to cloudy skies with isolated rainshowers or thunderstorms. The estimated rainfall amount is from 7 – 15 mm per hour (moderate - heavy) within the 300 km diameter of the Tropical Depression. Residents in low lying and mountainous areas of the provinces with PSWS#1 as well as the rest of Mindanao are alerted against possible flashfloods and landslides. Fisherfolks and those with small seacrafts are advised not to venture out over the Northern and Eastern seaboards of Luzon and the Eastern seaboard of Visayas. The public and the disaster risk reduction and management council concerned are advised to take appropriate actions and watch for the next weather bulletin.